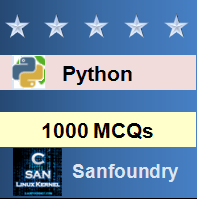 This set of Python Multiple Choice Questions & Answers (MCQs) focuses on “Turtle Module – 3”. 1. Which of the following functions results in an error? Explanation: The functions shown above will change the arrow to the shape mentioned. The functions turtle.shape(“turtle”), turtle.shape(“square”) and turtle.shape(“triangle”) are valid whereas the function turtle.shape(“rectangle”) is invalid. 2. What is the output of the snippet of code shown below? Explanation: The function turtle.tilt(75) will tilt the turtle. But the straight line (of 100 units) is drawn along the horizontal. Hence the output of the code shown above is a straight line of 100 units lying along the horizontal. Explanation: In the code shown above, we have used the function t.penup() to life the pen from the canvas. However, we have not used the function t.pendown() to keep the pen back down. The function turtle.isdown() returns True if the pen is down and False if the pen is not down. Hence the output is False. Explanation: The function turtle.width(x) is used to alter the thickness of the pen to ‘x’ units. The function turtle.span(x), turtle.girth(x) and turtle.thickness(x) are invalid. 5. What is the output of the code shown below if the system date is 18th June, 2017 (Sunday)? Explanation: The function t.towards(x,y) returns the angle between the line to the line specified by (x,y). Hence the output will be 180.0. Explanation: The distance() function returns the distance between the turtle to the given vector. Hence the output of the code shown above is 100.0. Explanation: In the code shown above, two pens have been used to create a shape similar to the alphabet ‘V’. The angle between the two straight lines is 90 degrees. Explanation: In the above code, three pens have been used to create a shape similar to the letter ‘T’. All the three straight lines are mutually perpendicular. 9. The code shown below will result in an error. State whether true or false. Explanation: Although a negative speed is not possible, the code shown above does not result in an error. Hence, the answer is False. Explanation: The function clone() is used to create a clone of the turtle, having the same properties such as position, coordinates etc. Hence, the properties of the t and t1 are the same in the code shown above. The function ycor() returns the y-coordinate of the turtle. Hence the output of the code is 60.0. Explanation: The code shown above creates a six-sided polygon. The output shape of the code shown above is will be a hexagon. Explanation: When not explicitly specified as auto or user, no adaption of the turtle’s appearance takes place and the mode is ‘noresize’. Hence the output of the code is: noresize.